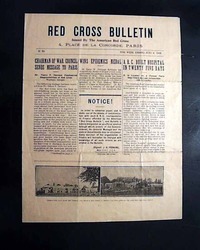 RED CROSS BULLETIN "Issued by the American Red Cross", Paris, June 8, 1918 An interesting & early little newspaper from during World War I in France. A front page war-related photo. Four pages, 9 3/4 by 13 inches, good condition. 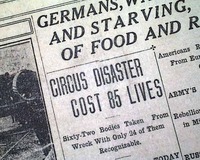 THE MORNING STAR, Wilmington, North Carolina, June 24, 1918 This 8 page newspaper has one column headlines on the front page that include: "CIRCUS DISASTER COST 85 LIVES", "Sixty-Two Bodies Taken from Wreck With Only 24 of Them Recognizable" and more. See photos for text on the Hammond circus train wreck. 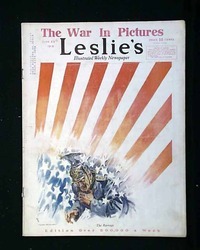 Leslie's Weekly, from New York City, dated June 29, 1918. The front page of this issue is an illustration entitled "The Barrage". This issue includes "Thuderstorm of War on the Oise"; "'With the Aid of God and a Few Marines --'"; "Our ally in the Far East"; "A soldier's Life Has Music Other than the Roaring of the Guns" and much more.